If you’ve purchased an LED or CFL light bulb recently, you’ve probably heard of color temperature. And likewise, if you’ve talked to an older family member recently about their lightbulbs (and honestly, who hasn’t? ), then you’ve probably heard about it as well, albeit in stronger language. So what is color temperature, anyway? Basically, it describes the color of your white light. That may seem counterintuitive; white light is, after all, white. It shouldn’t really have a color. But within the blanket category of “white”, there’s a lot of variation. Think of the cold, white light you might see in a hospital or 1980s office park. Now think of the warm, inviting light from an old incandescent bulb in your family room. What’s the difference? Color temperature. That sterile, industrial light probably has a high color temperature. The warm, inviting light has a lower one. Old incandescent bulbs were color temperature savants (at least according to most peoples’ tastes), whereas CFL bulbs (at least the older generation ones) were notorious for being in the ugly, cold part of the spectrum. Thus the rant from Grandpa, if he was forced to switch. Luckily, newer bulbs give you a lot of control over color temperature, whether they’re LEDs or CFLs. So how do you choose? 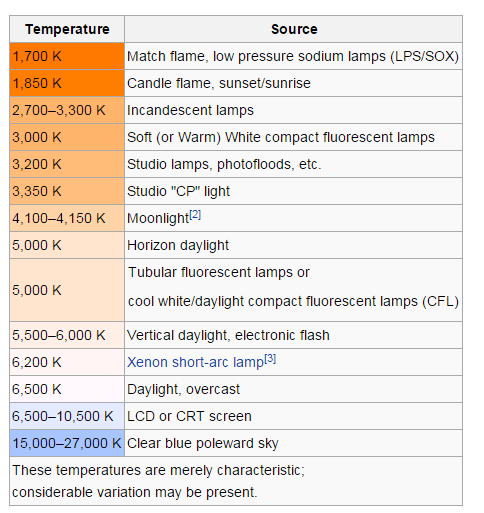 Color temperature is measured on a scale that you’ve probably learned and then forgotten: absolute temperature, measured in Kelvin. The scale starts in the lower 2,000Ks, with things like a match flame and the “warmest” of incandescents. On the higher end, you get light sources like the sun, which clocks in at a cold, blue 5,800 K (and here I always thought it was yellowish…live and learn). That pleasant, incandescent light you grew up with? It’s probably around 2,700K. The soul-sucking florescent lighting your cubicle? 4000k. This graphic, and the one above, shamelessly lifted from Wikipedia. When you’re buying bulbs, then, think about the kind of lighting you like. If you’re nostalgic for the glory days of old fashioned bulbs, go for LEDs or CFLs in the 2,000K range. If you prefer a bluer, “daylight” kind of light, go for the higher end of the color temperature scale. Make sure to think, too, about the kind of space you’re lighting. Higher color temperature bulbs are great for a foyer or perhaps even the kitchen or dining room, but a stark, unforgiving daylight glow probably isn’t right for the den or bedroom. Again, the most important thing about color temperature is that it’s a personal choice. Make sure to try a few different options before committing to a particular color temperature. And if you still can’t decide, just go with 2,700K. Grandpa will thank you.